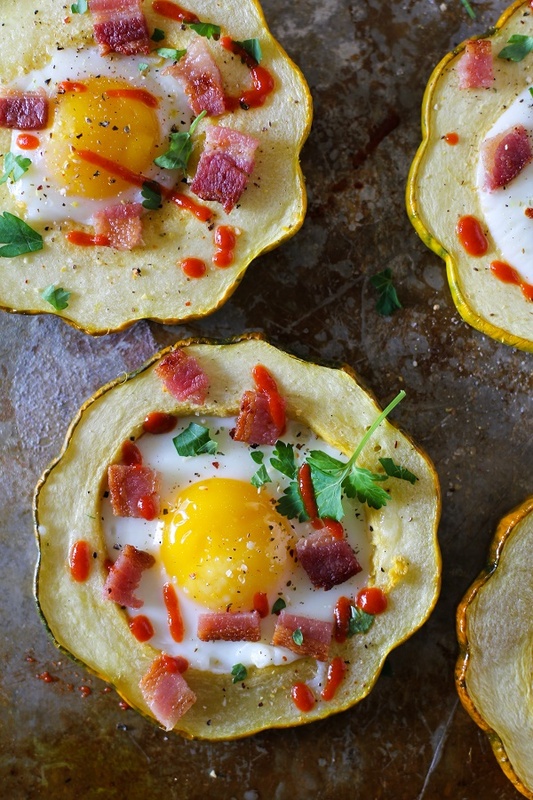 Use acorn squash for a healthful approach to the classic egg-in-the-hole! 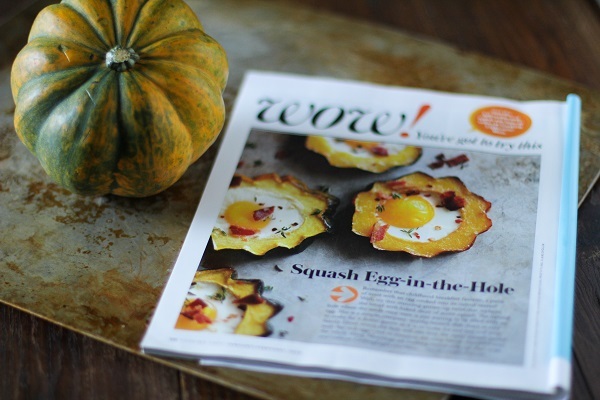 I was flipping through the January issue of Cooking Light, and on the very last page, I spied a gorgeous photo of squash egg-in-the-hole. I was instantly drawn to this unique take on a classic breakfast, so I went straight to the store to scoop up an acorn squash and immediately made the recipe. 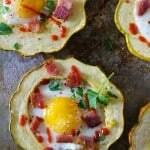 I even found a great video that Cooking Light posted on their Simmer & Boil blog on How to Make Squash Egg-in-the-Hole. I watched that thing, and you guys – you’d be so proud – I followed every last detail of the instructions. 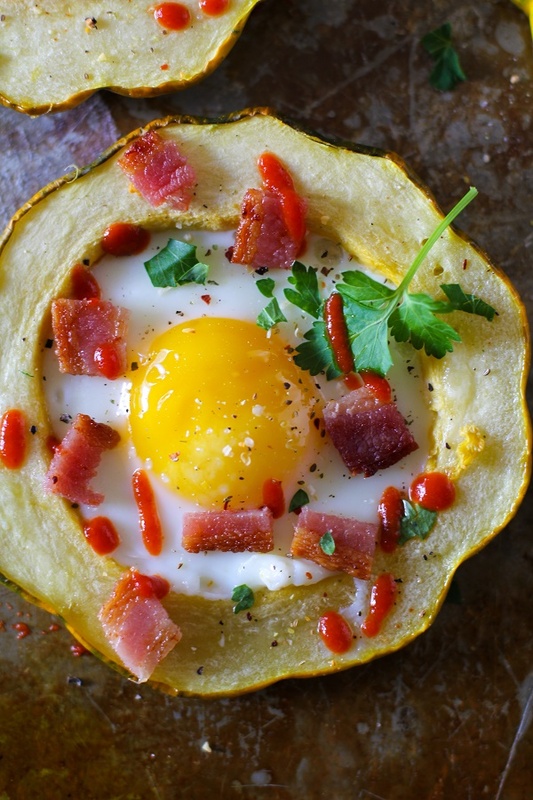 When this breakfast treat came out of the oven, I fantasized about making an acorn squash egg-in-the-hole sandwich by slapping two (or four) of the rounds together. You know, really double decker it out, bite it like a Big Mac, and accept all the runny yolk consequences. But then I reminded myself I had just mopped the floor, which happens just.like.never, so I employed my better judgement. Confession: Never in my life have I had an egg-in-a-hole using bread. Have you? When I was growing up, my family’s approach to breakfast on the weekends was more create-your-own-crazy-crêpe than it was put-an-egg-on-it. My lack of experience with egg-in-the-hole makes me wonder how it originated. No doubt it arose from a brilliant parent who stamped the center out of bread in the 1700s to make a crustless PB&J for their crust-loathing kidlet, and didn’t want to waste the remainder of the bread, so they made breakfast out of it. That sounds plausible, right? Because all brilliant recipes are born out of smart utilization of resources, right? Before making the recipe, I was concerned I’d end up with egg baked onto my cookie sheet, never to be clean again. But no such thing happened! You simply spray or lightly oil the baking sheet prior to setting down the acorn squash rounds, and they come right off, no biggity big. This breakfast recipe only requires a few ingredients, and you can doll it up with your favorite salsa, guacamole, hot sauce, and/or cheese. Because I like my eggs spicy, I added a little fire in the hole by drizzling sriracha over the finished product. Next time I make these, I’ll add grated cheese over the top and let it melt in the oven, because: duh. We’ve got egg-in-the-hole covered for breakfast, how about pigs in a blanket for lunch??! Any takers? Chop the tip and tail off of the acorn squash. Cut the acorn squash into four 1/2" to 3/4"-thick rounds. Scoop the seeds and innards out of each round and discard. Lightly coat both sides of each round with olive oil and place on a lightly-oiled (or sprayed) baking sheet. Sprinkle with salt and pepper and bake for 15 minutes, or until tender when poked with a fork. Crack one egg into a measuring cup that has a lip. Pour the egg into one of the squash rounds. Repeat with the remaining 3 eggs (Note: If you think you can carefully crack the eggs into the acorn squash, you can skip using the measuring cup, although I find it's easiest to use a measuring cup). I’ve never egged in a hole before. (Does that sound dirty, or is it just me??) But…egg acorn squashing in a hole sounds like it’s going to be my new favorite pasttime! Ohmygah, you have no idea how much I was resisting “in the hole” commentary. Took every.ounce.of.maturity in me to not talk about putting things in holes. Ugh. The dirty, dirty mind. this is more a question than comment. Is this gluten free? I am new to gluten problems and I have guest coming who are. Thanks for a quick response. This sounds yummy. 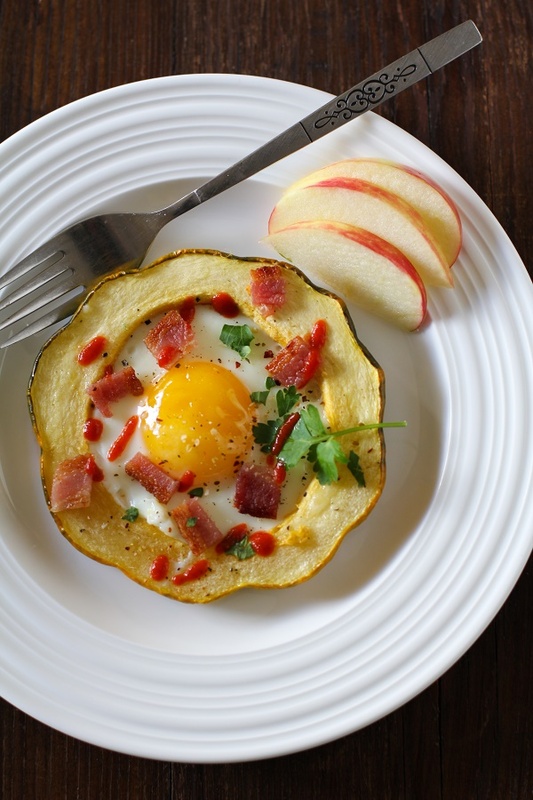 Acorn squash is gluten free as well as the eggs, so you’re good to go. Generally, hot sauces are gluten free simply because they’re pureed peppers of some kind. So keep the sauce simple. More elaborate sauces (meaning more ingredients, thickeners, etc.) could be a problem. My wife has Celiac, so I have been educated on this issue over the past few years. It doesn’t take much to cause a reaction, so we’re very careful. I live in Oz, and we can’t get acorn squash. What are some acorn squash substitutes please? This was amazing! I had never had acorn squash before. I also added some cut up fresh asparagus I had leftover from the night before and some fresh shredded Parmesan cheese . Will definitely be making again! I never would have thought to put these items together, but we really enjoyed it!